Kamal Gunaratne is a colorful character (Facebook profile here). The author of ‘The Road to Nandikadal‘ was also flagged as a murderer by Sri Lanka’s Foreign Minister, in Parliament. Former army major general Kamal Gunaratne is under investigation over the murder of an employee at the Sri Lankan embassy in Brazil, foreign minister Mangala Samaraweera told parliament today. Gunaratne, who was sent to Brazil as deputy ambassador by then defence secretary Gotabhaya Rajapaksa, murdered an embassy employee Nimal Rupasinghe with the support of two other embassy staff members, the minister said. 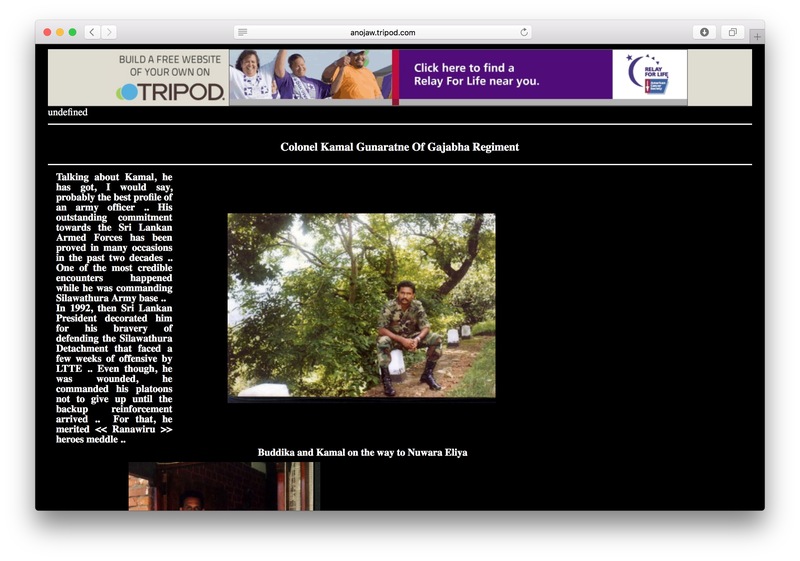 What appears to be a fan page of Gunaratne exists on the web at http://anojaw.tripod.com/kamal.htm. Access the archive of this page here.